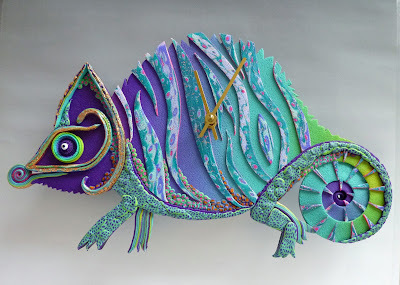 Here on Beading Arts, we first came across Ann Kruglak and her gorgeous work in 2010. You can read about Ann's earlier work here. Her vision for what she wants to accomplish with her art has not changed, but she is busy making some fabulous new things these days that she has been gracious to share with us! I believe that everyone is intrinsically creative, and the variety and amazing strangeness of our dreams proves. We all dream, which at core is, a creative act. Dreams and their origin in the deep psyche have been central to my life path, and to my art which connects me to my spiritual center, and the greater Mystery of the universe. I treasure beauty (in nature and art and all its forms) as a gift that infuses my life with meaning, joy, wonder and gratitude. By creating art, I work to bring more beauty into the world, in hopes of sharing a sense of wonder and wholeness with others. I created Mystic Dreamer: Art for the Earth, as a service project, to donate 100% of proceeds to rainforest preservation (through WorldLandTrust and NatureAndCulture) as a way of giving back to the Earth. My deepest hope is that my art project will inspire others to bring their gifts of service into the world. Visit me on Facebook for ongoing dialog on art, dreams, creativity and spirituality. Visit my Etsy Shop for gifts and treats! The Sacred Flame Teapot: This teapot is inspired by my connection to Pele (Hawaiian Goddess of volcanoes and fire) and Fire as a sacred element. I includes an element of the Phoenix which bursts into flame and re-creates itself periodically – and this teapot did just that. 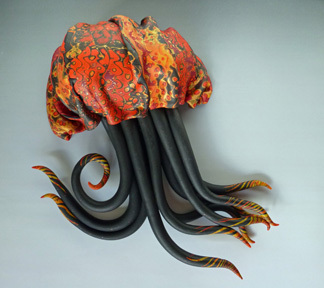 After winning 1st place in the IPCA Progress and Possibilities 2012 Sculptural Objects (Proficient Level), it broke, and has now been re-constructed into the Fire Jelly, a wall sculpture jelly fish (shown below). 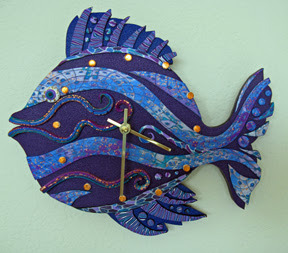 Animal Clocks: These are a new line of creativity for me, that I’m having a wonderful time with. 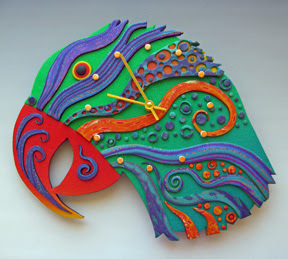 An Etsy customer who loved my clocks, and who is an animal lover commissioned the fish and parrot clocks for her home. Now I’m going on to additional animal forms, such as the chameleon (shown at the top of the post). I have great fun naming my clocks too: Dive Time, Squawk Clock, and my personal favorite, Iguana be a Great Day.